For some reason, whenever I mention Netflix in the title, traffic to the site rockets. And whenever I do a list, the ones that prove most popular usually list seven things. So, here are seven great comedies you can watch on Netflix (UK) right now. I’ve liked Stewart Lee (and of course Richard Herring) ever since I first heard Lionel Nimrod, and onward through Fist Of Fun and This Morning With Richard Not Judy. Their solo careers have been great too, and this stand up special is well worth a watch. 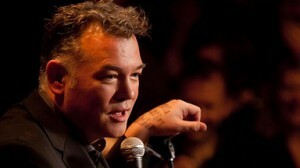 As an added bonus, there’s three series of Stewart Lee’s Comedy Vehicle on there too. What’s not to love about Maria Bamford? And here she really does bring the special to the comedy special. She performs an hour long set in her front room to an audience that consists solely of her mother and father. Stand up isn’t for arenas, and Maria proves it here. Rik Mayall. Nothing else need be said. This is a charming, unassuming sitcom about friendship and ambition, that moves along gently and beguiles all the way. Lovely. Vic and Bob return to the sitcom format for the first time since Catterick, and this time they decide to deconstruct the 70s model of the genre. Matt Berry puts in a huge performance as their friend, as does Morgana Robinson as the neighbour. There’s a reason this show has endured from a sketch on French & Saunders right up to the recent movie. It took the simple conceit of inverting the family roles of a sitcom and created a cast of brilliantly realised, completely flawed characters. Still great. Maria Bamford is back again with her sitcom that spans three time zones and details the lead up to her breakdown, her time in recovery, and the present day as she struggles to find her feet again. This really is nothing short of genius. It’s coming up to the end of the year, so I thought I’d make a note of some of the great comedy DVDs I’ve bought, or watched, or re-watched this year. Basically, this is the seven that jumped out at me when I started to think about it. They are presented in no particular order. It’s such a shame this show was cancelled, because I was a big fan of it. I almost dismissed it at first, thinking it was just puppets swearing, but it’s not like that at all (except one puppet, who swears a lot). The characters are well-drawn, brilliantly voiced and perfectly performed. You’ll recognise the voices of Katy brand, Lucy Montgomery, Dan Tetsell, Paul Kaye, Rufus Jones and Tony Way. The puppets even got to appear at the Proms in 2011. I think it’s worth watching for many reasons, but the song about Justin Bieber is worth it on its own. If you haven’t seen it, you should go out and buy it now. I found this on offer and snapped it up in the summer, and I couldn’t wait to watch it again. I remember seeing it when it was first broadcast on BBC Three, and I think it’s one of Vic & Bob’s many finest hours. And it was as great as I recalled. 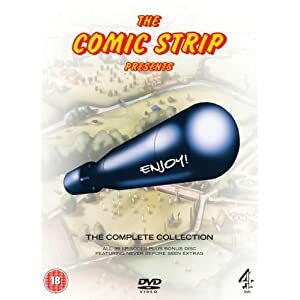 Alongside the main characters, we meet some delightfully drawn characters portrayed by Reece Shearsmith, Matt Lucas, Morwenna Banks, Charlie Higson, and Mark Benton. The show takes its cue from their earlier outing The Weekenders, which was part of Channel Four’s Bunch Of Five season, and many of the characters we meet were first encountered in Bang, Bang, It’s Reeves And Mortimer. As I write this, the DVD is only a fiver, so you’d be a mug not to go and grab it. 2012 saw the return of the Famous Five, which was a nice revival on Watch. It made me dig out my boxset and crack it open once more, and while it was a mixed bag, it was always worth watching. Five Go Mad … is always fun to watch, and things like GLC, BAd News, and The Strike are rightfully well-remembered and well-regarded. But there are a fair few great moments in the less famous ones, my favourite being Dirty Movie with Rik & Ade on fine form. There’s plenty to like about this set, not least the fantastic packaging- but it’s what’s inside that counts. And you can buy the whole lot for less than twenty quid at the moment. Stewart Lee is one of the best stand-up comedians working today (and maybe at any time), but he’s not to everyone’s taste. I’m a big fan though, and its great to see him perform live, and his TV show goes to some length to recapture that live performance atmosphere. Aside from the brilliant stand-up, there’s a number of excellent sketches, and some great interview snippets with Armando Iannucci. And anything that features cameos from Kevin Eldon and Simon Munnery must be worth a watch. I want his clown car, to go with my lovely Fist Of Fun DVDs. But more about those another time. For now, feast and gorge on this series instead. Come on, who doesn’t like The Muppets? And if you enjoyed their film this year, why not have another visit to the show that started it all. No, not Saturday Night Live, or Sesame Street, it’s the original, most sensational, inspirtational, Muppetational, this is what we call the Muppet Show. Seeing these for the first time in years in the high quality DVD transfers was a real treat. But you don’t want to know about seeing the fabric textures of the puppets, you want to be reminded of all the great sketches and special guests. And they’re all here. Two pilots of the show failed to generate any interest from US TV networks (morons), and it was left to the UK producer Lew Grade and ATV to produce it, and the show was syndicated back to America via ITC and CBS. I stooped, I remember, to pick a buttercup. 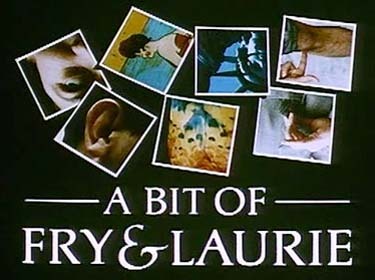 Another collection I took out of mothballs was all four series of A Bit Of Fry And Laurie. This is a marvelous sketch show, beautifully written and perfectly performed. After a pilot that was broadcast on Boxing Day in 1987, the first series began in January of 1989. It was great fun reacquainting myself with Tony and Control, John and Peter (DAMN), and the Mr Dalliard sketches. It’s also possible that Hugh Laurie got an F word past the broadcast sensors, and it’s fun to spot that. Included on the DVD is The Crystal Cube, which is a pilot made with Footlights colleagues Emma Thompson and Tony Slattery. You should get it. I’m constantly dipping in and out of my Seinfeld box set, because frankly, it is one of my most favourite things to watch. I know so many people in the UK who dismiss the show on nothing more than a dislike of the theme music, which makes no sense to me on a number of different levels. 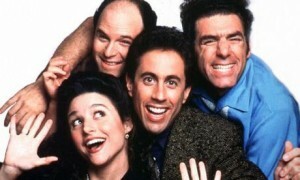 Seinfeld’s influence on American sitcoms is palpable, and it has infused an awful lot of British shows too. Great episode follows great episode, and it becomes difficult not to watch it in marathon sofa sessions. The extras and commentaries on the DVDs are excellent too, but it’s the shows themselves that you need to savour again and again. And if you’ve never seen it, seek it out and grab a copy as soon as you can. If you hate it, blame someone else. So there we go, that’s the seven comedy DVDs I’ve enjoyed the most this year. Until I remember that I bought Sorry!, and Clarence, and some great stand up shows. Basically, this is just the first seven that sprang to mind. If you want to discover some more esoteric and oft-forgotten sitcoms, you should have a look at my Sitcom Advent Calendar.